The GYROTONIC Expansion System embraces some of the movement principles found in yoga, dance, gymnastics, swimming and tai chi. The circular, spiraling motions allow the user to increase spinal flexibility, stretch and strengthen muscles, decompress joints and strengthen ligaments and connective tissues throughout the body. The primary piece of equipment, the GYROTONIC Pulley Tower, can be adjusted to meet the needs of people with varying body types and fitness levels. The exercises allow complete freedom of movement without jarring or stressing the joints. 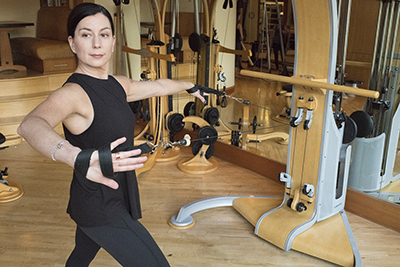 As in Pilates, the equipment is designed to challenge and support the body. CONTACT THE STUDIO OR USE THE BUTTON BELOW TO SCHEDULE YOUR FIRST FREE SESSION.